The 2008 fall, central flyway flight estimate of 37.3 million ducks is down 9 percent from last year and 11 percent "above" the long-term (1959-2007) average. Estimated numbers of mallards, scaup, blue-winged teal, green-winged teal and redheads, were similar to last year. However, wigeon numbers declined by 11 percent, gadwalls declined by 19 percent, pintails by 22 percent, shovelers by 23 percent and canvasbacks were down 44 percent compared to 2007. 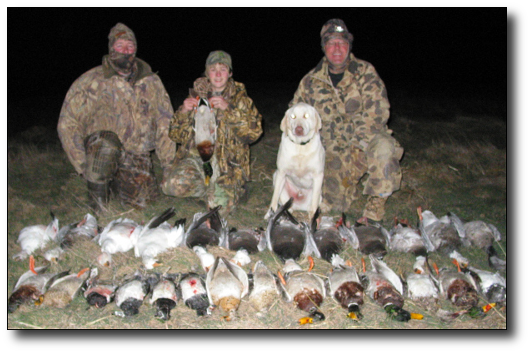 Raedeke pointed out that waterfowl hunters shouldn't be too discouraged." "Floods early in the year hurt our wetland areas, and a late-summer drought cut into food production in southern Missouri. But we received good weather during the hunting season, and that kept a lot of ducks around. We ended up with a record harvest, and we could still have a very good season this year, too, if the weather cooperates." 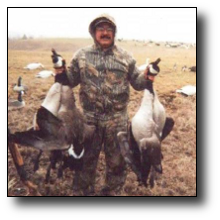 Canada Geese had a much better spring nesting effort than 2009, so goose hunters in the northern states could have an excellent year if the weather cooperates. Take Iowa for example: between April 8-15 2010, Canada geese were counted on 164 survey plots in Iowa, 69 of which were located in Iowa's portion of the prairie pothole region (PPR) and 95 in the rest of the state. The Canada goose population for 2010 was estimated to be 96,738, which is statistically unchanged from the 2009 estimate of 104,844. The Canada goose population appears to have stabilized in the past 6 years after substantial growth in the 1990s and early 2000s. The number of indicated pairs, the breeding component of the population, has remained statistically unchanged for the past 5 years. The most notable change in goose numbers in 2010 was the decrease in the number of geese observed in groups compared to 2009. On the whole, adjacent states in the central flyway had similar counts. Five distinct populations of snow geese have been identified for management purposes: Mid-Continent, Greater Snow Goose, West Central Flyway, Western Canadian Arctic, and Wrangel Island populations. Management of each population is guided by plans created through cooperative efforts of the flyway councils, representing states, provinces, U.S. Fish and Wildlife Service and Canadian Wildlife Service. Management plans provide guidelines for population size, distribution and use (hunting, viewing, photography, etc.). The birds that migrate through North Dakota are part of the Mid-Continent Population. These geese nest from the southern shores of Baffin Island, to South Hampton Island, along the western portions of Hudson By and west across the northern coast and islands of Canada to about the 100th meridian. They migrate south along Hudson Bay and stage in the prairie regions of Manitoba, Saskatchewan, and the Dakotas each fall. Wintering grounds are principally in Texas, Louisiana, and eastern Mexico, but some winter as far north as Kansas. Blue geese are found only in the Mid-Continent Population. All snow geese that fly through North Dakota each spring and fall are part of the Mid-Continent populations. Much of this report will concentrate on these birds. Only the Wrangel Island birds are not increasing steadily. Mid-Content snow geese are the most abundant of all snow geese, with an annual population index approaching 3 million birds. The objective for this population is 1-1.5 million birds as measured by the annual mid-December wintering ground survey. This survey provides an index, or measurement that is repeatable and therefore comparable from one year to the next. It is not a complete count of all birds.